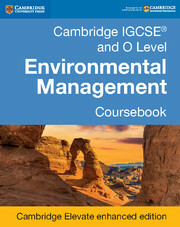 Resources tailored to the Cambridge IGCSE® (0680) and O Level (5014) Environmental Management syllabuses, for first examination in 2019. 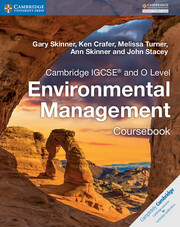 Cambridge IGCSE® and O Level Environmental Management Workbook is tailored to the IGCSE (0680) and O Level (5014) Environmental Management syllabuses for first examination in 2019, and is endorsed for learner support by Cambridge International Examinations. The workbook provides varied exercises that encourage students to practise the knowledge and skills they need for the course. 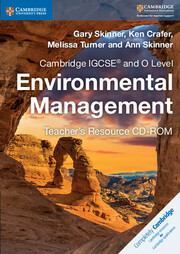 Answers to all exercises can be found on the teacher's resource CD-ROM. Endorsed for learner support by Cambridge International Examinations, so teachers and students can feel confident that the workbook meets students’ needs. 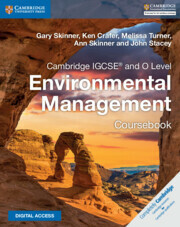 Contains varied exercises throughout to help students to build vital skills of information handling, analysis and evaluation and making judgements. Answers to all questions are found at the back of the book.